My fiancé and I were recently invited to the birthday celebration of my fellow Soul Cycle freak and clean eating nut. There had been talk of the calmness and serenity of Lake Tahoe, but nothing prepared me for the tranquility and beauty that engulfed us upon arrival. The sun-filled days started with morning yoga and slowly progressed to sipping chilled wine while sailing the majestic crystal blue lake that was surrounded by snow-tipped mountains. Evenings were spent congregated around the fire pit with s'mores, liquid libations, melodic chatter, and good tunes. For the culminating meal and birthday celebration, the host arranged a jaw dropping seafood feast. I hope that the pictures below do some justice to the beautiful food and unforgettable scenery that we were fortunate enough to experience. Clean eating can mean a multitude of things to different people but, at its core, the ideals of eating pure, real food remain. In essence, clean eating is centered around whole foods and the avoidance of anything processed or refined. I try to eat this way for the most part, but understandably it's not possible to be a purest all the time. My most common "hick up" is during the 3pm post-lunch almost done with work slump, when I retreat to the cafeteria for a pre-packaged Sabra with pretzels and an iced double espresso. However, by focusing on eating foods in their most unadulterated state, you maintain control over what you put into your body and hence your overall health. 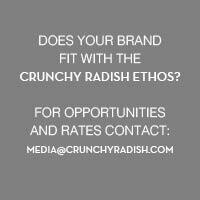 The recipes I share here, on The Crunchy Radish are my attempt to "keep it clean". Although nothing is quite overtly complex, the recipes remain true to the "real" ingredients which I use and always focus on overall wellness and of course flavor. In "Arugula", "Avocado", "Fiber", "Grains", "Iron", "Sweet Potato"
This dip/sauce/dressing, what have you, is delectable and I could literally drink it. I hope you find it as scrumptious as I do. Recently, I have been feeling highly motivated to experiment with creative vegetarian cuisine. If I had to put a label on my dietary habits, I would fall along the lines of a pescatarian who dabbles in Pio Pio’s deliciously roasted and flavorful chicken and someone who fully embraces the comfort of turkey meatballs on a Sunday night. To find inspiration, I flipped through a lovely cookbook called Super Natural Every Day by Heidi Swanson. It is a vegetarian cookbook devoted to wholesome natural recipes. I found the author's philosophy about ingredients and cooking very in tune with my beliefs and was immediately consumed with decisions on which recipe to attempt first. In "Avocado", "Broccoli", "Coconut Oil", "Grains", "Pesto", "Saturated Fat", "Soup", "Split Peas"
The recipe for this pasta dish was given to me by one of my loyal readers (the number of which I can probably count on one hand). It is simple, smooth, and scrumptious, and tastes decadent despite its healthful ingredients. Whipped avocado becomes a creamy and dreamy sauce and was the perfect foundation for my spiced rubbed salmon. In "Avocado", "B6", "Cheese", "Fiber", "Folate", "Monounsaturated Fat", "Omega-3", "Pasta", "Polyunsaturated Fat", "Potassium", "Salmon", "Vitamin D", "Vitamin E"
In "Avocado", "Breakfast", "Cheese", "Chili's", "Eggs"
Mixed berry and banana smoothie with fat free plain yogurt, almond butter, chia seeds, and a splash of OJ with Ezekiel sprouted grain and seed english muffin, Williamsburg Mayo, finished with sea salt. In "Avocado", "Berries", "Breakfast", "Smoothie", "Yogurt"